President Trump called the family of slain NYPD officer Miosotis Familia to the stage during his speech Tuesday at 37th Annual Peace Officers’ Memorial Service. 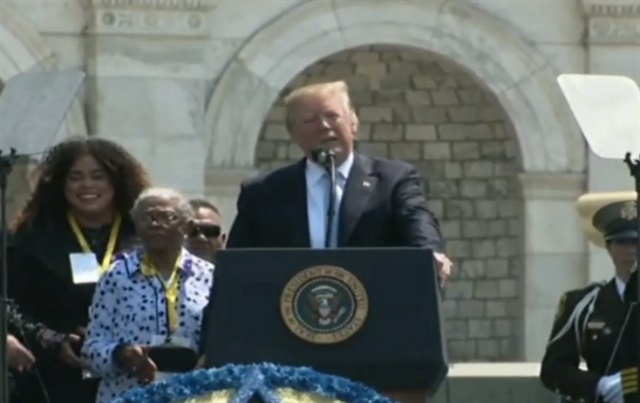 President Donald Trump gave a rambling but emotional speech praising fallen law enforcement officers and their families during the 37th Annual Peace Officers’ Memorial Service. Speaking from the steps of the White House, Trump spoke of his strong support for law enforcement and pledged that he nor America would forget the sacrifices of officers who died protecting the public and the survivors they left behind. * The family of Lt. Aaron Allan of the Southport (IN) Police Department. Allan was killed in July 2017 when he was shot responding to a vehicle accident. Trump spoke of how well loved and respected Allan was in his community for both his service as an officer and his charity work for children in need. * The family of Las Vegas Metropolitan Police Officer Charleston Hartfield. Hartfield was killed trying to help the wounded and direct people to safety during the October 2017 Las Vegas Concert Massacre. He was off duty when he was killed. “He gave his life so that countless others may live,” Trump said. The discussion of officers killed in ambush led to the most emotional moments of the speech. In what appeared to be an unplanned move, the President called the family of slain NYPD officer Miosotis Familia to the speakers stage. Familia was ambushed in her police vehicle and killed in July 2017.